For more years than scholars care to number, and not merely because they can’t quite agree on a number, the lands of Talodrihm have been nothing more than a bleak wasteland infested with dangerous monsters and undead horrors. Now, an expedition has been called and adventurers are needed to search the land for a means of eliminating Bleakgate Citadel; the source of magic afflicting the land. Together you will travel through the desert to the town of Shacklefort where you must find the last remaining sage in the region. With his knowledge you will most assuredly find a way to restore this place to the gladness it once knew in the memories of the oldest elves. This campaign is designed for any edition of Dungeons and Dragons as well as the Pathfinder role-playing system. The properties contained in this adventure are somewhat generic, making it quite easy to utilize any rule system, though the referee will need to consider the following before running the adventure: firstly, some preparations will be needed, such as maps for different locations. Second, if you lack certain rule books, items and monsters may need some tweaking. For example, if you run into a description of a monster in the text that you lack in your collection of books, simply use the closest thing you do have available, or else create one. Just remember to scale the encounters appropriately for your players’ characters! “Just over the next dune, friend adventurers! I know, I say this many times, but now I promise you this is our last dune together before we reach Talodrihm. Begging your most humble pardon, while you were sleeping last night I took the liberty of reading your letter from your masters. So you expect to purge the darkness from the land. Not that I doubt, but many adventurers have come and gone: some even ran away screaming into the desert with half their sanity dragging behind them! Not to worry, your confidence and steelie determination makes my heart feel very big with confidence! Just remember your dear friend, Alimar, if you do somehow manage to restore this region to its former glory. Beyond this text, the party makes way to the Caravan’s Resort. Once the party has equipped themselves with whatever their starting funds can afford, all that remains is to simply move through the following locations! A comprehensive blow by blow list of every locale for the campaign, which the party may engage in non-linear fashion. It should be made evident in the text that some places are considerably more dangerous than others, requiring the party to exercise caution once they reach a new destination. In other words, they should never be too proud to run! As the party reaches a new destination, read the italicized texts to better acquaint them with the flavor and conditions of the area. The players should also be introduced to the Areas of Interest, but the details attached to each area of interest should only be introduced in the manner described! It is recommended that the referee read through each location and their areas of interest before running the campaign so that he or she may have a good feel for what to expect. Should the party wish to encounter monsters to farm experience points, each location is accompanied by a list of example monsters that one will encounter. Any treasure to be had by these encounters should be kept rather minimum, especially with creatures that tend to have hoards. When gifting the party with money and experience points, use appropriate tables and award them based on their level! Caravan’s Resort is the official starting position for the campaign. Should players have not adequately purchased supplies, most especially food and water, they may do so at this location. It also sells common tools and armor no greater than studded leather. The party may press onward to new locations from here, or, should they desire to gain some experience and money, they may take advantage of the quests posted here. 1- Community Ring: at the very center of Caravan’s Resort is a small, open area with a great oaken pole stamped into the earth. This pole serves as the Bounty Post, and surrounding it are a few general shops that sell items mentioned above. Shimah, a lawful natural male fighter, serves as the tiny settlement’s source of authority, and if asked about Talodrihm, he will simply say that it is overrun by the corrupting powers of undeath and that one will go mad simply by entering it. 2- Bounty Post: as stated in the Community ring, the immense oaken pole has several tattered parchments tacked to it. Most of these bear requests for assistance from those who dwell at Caravan’s Resort, and all have been fulfilled, save three. A: the first post begs for aid in locating a kobold lair up in the desert. The kobolds have robbed merchants of their gems and safeguard them in a small tunnel system, the entrance to which may be found hidden amid a cluster of jagged rocks, which jut out of the sand like dragon’s claws. B: Orman the Glutton is accused of stealing food and water from the community storage and keeping it for himself, but inspections of his yurt reveal that he has very little food. By sneaking into his home and turning up the rugs, which cover his floor, one will find a trapped cellar door leading to the stolen goods. The trap consists of a bell, which when rung will alarm Orman’s four 1st level fighter guards. C: Monstrous vultures have carried off and slain horses belonging to some of the merchants. A saddlebag on one of the slain animals contains a valuable journal that one of the merchants would like to have returned. 3- Outer Ring: circling caravan’s resort are portable walls for defense and parked wagons, which fill the gaps. People in the Community Ring often complain that bandits will come at night and rob the wagons. Should the party offer to protect the wagons at night they will have the opportunity to fight off the bandits and track them to their hidden hideout in the nearby cliffs. Here the bandits hide in a small cave network filled with stolen goods as well as a number of captured people whom the bandits intend to sell as slaves. Rescuing these people will bring the party a goodly reward! Shacklefort serves as the primary hub for trade and commerce in the area, so named because of the stubborn determination of its residents to remain grounded in Talodrihm, even against the great evil working against them. The people offer much more by way of goods and services, but these will be off limits until the party can figure out what has caused their well to go dry. Once the well is unstopped, the party may purchase better gear, horses, take on hirelings and so forth. In order to discover where to go next, the party must locate the sage known as Hennik, the last surviving sage with clues on how to proceed. 1- Mage Furgiss’ Tower: sticking out of the community like a bent and broken thumb, this ramshackle tower’s features belie its rather posh interior. Many people in the community speak of how Furgiss’s tower descended from the sky like a curious craft one day and planted itself in one of the only vacant lots remaining in Shacklefort. Rumors spread that the cranky old magic user is hiding from his enemies, but the authorities of Shacklefort allow him to remain so long as he helps protect the citizens against monsters with his powerful fireballs. If approached peacefully, he will offer his services as a merchant of sorts, offering potions, mage scrolls and magical items for sale. 2- Grey Temple: a bleak temple fashioned from marble and dedicated to the worship of neutral deities, the Grey Temple is the only source of spiritual enlightenment for the region. Its clerics offer services ranging from healing magics to protection scrolls and curative potions. If the party can prove to be reliable to the community by restoring the well, the clerics will ask that they retrieve one of their sacred statuettes from the clutches of a band of lizard folk. The lizard folk are encamped out in the wastes and are lead by a shaman who will protect them with his spells if attacked. Returning the statuette to the temple will earn the party an appropriate amount of gold and experience points for their level. 3- Guard Posts: consisting of a small fort made from piled stone, the guard post houses some twenty lightly armored men lead by their captain and leader of the community, Sir Waltmin. Waltmin is a lawful man and protects the people, but will not extend his resources beyond the walls of Shacklefort. Should the players restore the waters at the community well, Waltmin will award them with an appropriate amount of gold and experience points for their level. In addition, he will also allow the party to purchase horses or camels for their journey. These are in short supply, however, no more than ten of each are available. 4- Merchant’s Quarter: at the heart of Shacklefort is a ring of densely cloistered shops and one inn. The party may purchase any equipment and weapons and armor up to +1. Gems and other valuables may be appraised here at the cost of 10 gold pieces per item and hirelings may be taken on at the inn. There is one training hall here where the party may pay to increase in level once they have obtained enough experience points. The cost to level up in this campaign is equal to 100 gold pieces per level being obtained. 5- Community Well: in the heart of the Merchant’s Quarter is the community well. Shaped like a statue of a sea horse, the well once fed the town with a limitless supply of fresh water. Now it scarcely brings even a trickle as unknown forces have blocked off the flow. Should the party enter down into the well they will discover an opening, which leads into a rocky cave system. The caves are infested with goblins and other diminutive horrors. These are responsible for blocking off the water flow with a wall of bricks and plaster, which is located at the very end of the tunnels. Once this is unblocked, the party will be flushed out and made to shoot directly out of the well, which will spring forth to life with the return of fresh, drinkable water. The completion of this quest will earn the community’s affections and a number of experience points and gold equivalent to two levels higher than their appropriate level. Hennik will provide small amounts of detail about the different locations in the region and as an added bonus he will identify any magical item the party brings to him at the low cost of 10 gold pieces. It should be noted here that these enemies are found throughout the region when the party travels between locations. Protected by a deathly barrier, which keeps intruders away, the citadel is impossible to enter without first accomplishing the steps listed in the Writ of Opposition. The citadel itself is ruled by Oso Duchan the demilich, who continually puts a blight upon the land that causes the many dinosaurs and people to go mad and attack other living things. Once Oso Duchan is defeated, read the end of the module for details on the end of the campaign. The GM should note that even if the players have removed the barrier surrounding the citadel, they cannot pass through Rambreaker Keep without the Key of Scourges, which is located in Charnel Hollow. 1- Ring of Curigonne: the very base of the energy field, which drains the life of any living thing that comes into contact. The energy field resembles a faintly blue dome, which subtly twists and contorts as winds disturb it. Once the preparations detailed in the Writ of Opposition are made, the field will no longer pose a threat and the party may freely enter the interior of the immense ring. The ground immediately at the base of the ring is littered with the bones of many dead creatures, but once the barrier is removed, swarms of diseased rats will flea from the citadel and attack anything that gets in their way. Carefully searching the bones will turn up bits of treasure! 2- Rambreaker Keep: At the base of the citadel is a keep in the shape of a long dragon’s head with its mouth open wide. The eye sockets of the dragon’s head serve as windows where many skeletal archers are stationed and ready to fire upon anyone attempting to enter. A sizeable force of sturdy stone golems block access to the gates and any who attempt to reach the gates will be sealed in on both sides by twin portcullises. If the party should become trapped by the portcullises, they will have to do battle against a beholder, which will descend from the cranium of the keep and down through a hole, which is positioned right above the trap. 3- Hollow Heart: a circular courtyard stands just beyond the Rambreaker Keep. The courtyard has many terraces surrounding it and the ground is littered with burnt corpses, which remain frozen in their last moments of agony. When the party enters this place they will find many skeletal arches lining the walls surrounding them and four young red dragons will lead an attack against the hapless players. After this is managed, the party will need to search for four levers, which will grant them access to the Lower Halls of the Bleak Gate Citadel. 4- Lower Halls: the lower halls of the Bleak Gate Citadel are very much a labyrinth with several rooms, four of which contain pools of strange liquid. Anyone who enters into these pools will need to make a resistance to prevent being slain outright. Each of the pools has one of the following symbols: a heart, a skull, the sun and the moon. Knowledgeable characters may discern this to mean life, death, light and dark and if appropriate spells are cast into the pools, a new chamber will appear at the very center of the labyrinth with a stairway leading up to the Middle Halls. For the pool of life, a healing spell should be cast. For the pool of death, any necromantic spell will do. For the pool of light, a light spell will function. Lastly, for the dark pool, a spell of darkness will open the way. Should the characters not have necessary spells at their disposal, the game referee may scatter wands or scrolls with needed spells on this floor. 5- Middle Halls: these halls are somewhat similar to the Lower Halls except that the central chamber, which the party arrives in from the previous floor, opens clear to the top where the party can see a large, ghostly white crystal suspended high up by chains. Anyone attempting to fly up here will be stricken by a deadly trap, which ushers forth currents of electricity similar to a lightning bolt spell cast by a tenth level mage. In the surrounding halls are passageways and rooms choked with large webs and infested by giant spiders and mummies whose bodies are wrapped in webs rather than cloth. One of these mummies has a strange scepter, which when taken to the central chamber on this floor will fit into a recess in the wall. Once activated, the floor will rise up to the next chamber and the chains and traps blocking the way will retreat harmlessly into the walls. 6- Higher Halls: here the uppermost central chamber is clear and the party comes face to face with the ghostly white crystal. Inside the crystal they can see a headless lich suspended in murky light. This crystal is nigh invulnerable, but careful inspection of the headless lich contained within will reveal that the remains of its neck support a strange medallion, which is needed to reach the Ramparts and Turrets section of the citadel. Exploring the network of hallways and rooms surrounding this chamber will turn up encounters with many kinds of undead foes, but two rooms in particular should be of note. One room contains a gong and the second a hammer. These artifacts are guarded by strong demons, but once claimed and used in the central chamber, the crystal surrounding the lich will break apart, granting the party access to the medallion. The medallion fits into another recess in the wall, which opens to reveal stairs that go up to the Ramparts. 7- Ramparts and Turrets: it should be noted that many stairways run throughout the interior of the citadel, but these have been blocked off by collapsed stone and magically enchanted doors of adamantium. Because of this, the only way for the party to proceed is to solve the puzzles on each floor. Once they reach the Ramparts and Turrets they will find a gridwork of walkways leading to various towers. These towers contain treasures and enemies, but ultimately lead to a singularly large tower that rises high above them all. This has an impenetrable adamantium door, but observations will reveal that the architecture of the tower allows one to easily climb to the roof. Up on the roof of the tower is a flat space where a pair of glabrezu guard a doorway down into the private chamber. If approached, Oso Duchan will draw the party into its eyes where their bodies and souls will be transferred into the gems, which line its teeth. There is no saving throw to avoid this as the ldemilich’s powers are unfathomable. Once trapped in a gem they will be forced to do battle with its essence. 9- Inner Realm: void of swirling shadow where the essence of Oso Duchan takes on the form of a chaotic being accompanied by many lesser minions. For his stats, simply use the most powerful planar entity you feel your party has any chance of defeating. His minions should also pose a challenge, though not necessarily through sheer numbers. Once Oso Duchan is defeated, see the note at the end of the module. It should be noted here that these monsters are the sort encountered by the party during their wanderings through the Bleakgate Citadel. The top of the Spiral Bridge is the place mentioned in the Writ of Opposition where the task of breaking the barrier around Bleakgate Citadel must be accomplished. In order for this to work, the party must acquire the items mentioned on the scroll: the Red Pearl and the Wand of Recharge. Using the wand will cause the pearl to lose its red color and shine like a small sun. When held aloft, the pearl will focus its rays upon the barrier surrounding Bleakgate, causing it to dissipate into nothingness and the pearl will turn dark and red once more. 1- Lower Spiral: perhaps the easiest portion of the climb, this trail winds its way up slowly along the lowest portion of the Spiral Bridge. Many crawling and biting creatures infest this portion of the climb, but carefully searching it will reveal a crack in the rock where the party will find the skeletal corpse of a halfling thief. The thief still clutches a magical item, but when this magical item is removed, a small company of wights will come down the trail and commence an attack against the party. 2- Middle Spiral: this portion of the trail climbs around the Spiral Bridge more steeply and has a trap emplaced to bar the party’s progress. Higher up, an outcropping of rock serves as a perch for a band of bugbears who will fire on the party with flaming crossbow bolts. Should the party reach the outcropping, a cascade of rocks will be released, requiring the party to resist with finesse. After passing this obstacle, the party will face off against the leader of the bugbears, a fellow much larger than the average bugbear with skills as a fighter. 3- Higher Spiral: at last, the longest stretch of the Spiral Bridge is far too steep for the party to climb, requiring them to carefully climb until they reach a hole in the rock, which leads into a chimney that ascends all the way to the dragon’s perch. The chimney is infested with dangerous bats, but otherwise poses no obstacle beyond climbing the remainder of the way. 4- Dragon’s Perch: out of a hole, the party reaches the upper platform of stone where a large blue dragon is perched. The dragon usually circles around his perch, scanning the ground for victims, but as soon as the party stands upon the top of the Spiral Bridge, the dragon will descend and attack. With the dragon vanquished, the party will find its hoard and will have the location secured for their future endeavors. Once they acquire the Red Pearl and the Wand of Recharge, they will finally be able to dispel the barrier around Bleakgate Citadel. Note that once the dragon is dead, it will tumble over the side of the perch and land on the Crooked Corner, destroying the location entirely and everyone in it. Crooked corner is a wicked little town run by the villain, Dastardly Dave. He is a bard of small reputation who plays the fiddle as well as he wields a blade. Were it not for his presence in the Crooked Corner, its seedier residence would have long ago slain each other, for he uses his music to create a semblance of structure. The gates to the Spiral Bridge are exceedingly tall and locked by a magical bolt, which may only be retracted by the voice of Dastardly Dave, which he will do for anyone who can bring him the head of a manticore. Note that once the dragon on top of the Spiral Bridge is slain it will fall on the Crooked Corner and destroy it along with the gate blocking access to the path leading up. 1- Brothel ‘n’ Bar: nasty little tavern filled with cutthroats and murderers of every kind. Should the party try to stay here during the night, they will awaken to every scoundrel in the entire dive bursting through every window, door and secret compartments in the walls with the sole intent of killing them and taking their stuff. 2- Angst and Anvil: amid the dozen or so small shacks is one dwarfed by them all, with a smithy built beside it. This smithy is run by an angry man with a sordid past that taught him everything he knows about forging blades. He will refuse to speak to the party, but should they do something kind for him, such as buy him a drink or gift him with a valuable item, he will tell of a meteor out in the wastes. This meteor is crawling with giant centipedes, but if the party brings the great rock back to him, he will forge a +2 longsword and a +2 suit of plate mail armor. 3- Dave’s Delectable Dive: the largest shack in the place, Dave’s Delectable Dive looks haggard on the outside, but its interior has been furbished with surprisingly luxurious furnishings. Dastardly Dave surrounds himself with at least a score of strong and menacing-looking brigands who are ready to fight at the drop of a hat. As stated above, Dastardly Dave will open the gates to the Spiral Bridge if the party can bring him the head of a manticore, which he says live by the Filthy Falls. Once the party brings him the head he will head straight away with them and unbar the gate. Consisting of the waterfall and some bits of land surrounding its base and its height, the Filthy Falls is quite important to Talodrihm as it once served as the main source of nourishment to the region. Now cursed by the energies emanating from the Bleakgate Citadel and poisoned by dragons. It is important for the GM to note that when these dragons are eliminated, the people of Shacklefort will reward them with appropriate amounts of experience and gold for their level. 1- South Bank: along the southern bank of the Filthy Falls is a dense expanse of scraggly vegetation. Searching and hacking through these spiny growths will bring the party into a lair belonging to a herd of gorgon bulls. These will immediately attack, but defeating them and searching the lair will allow the party to find a suit of +3 banded mail armor and a +2 large shield. 2- North Bank: along the northern bank of the Filthy Falls is a dense expanse of scraggly vegetation, similar to that, which grows against the South Bank. Carefully searching this area will bring the party to a tiny settlement belonging to psychotic goblins, which will attack anything on sight! Hidden in the goblins’ dome-like, thatched houses is an alchemy lab containing 10 random potions. 3- Churning Flow: careful observation of the churning waters at the base of the falls will reveal that a monk of great skill and power is sitting directly below the onslaught of filthy water. He is in a deep state of meditation and quite impervious to any harm or attempts at communication. Slaying the black dragons who are poisoning the water above the fall will awaken the monk from his meditation and he will offer to teach the party some of his fighting skills, granting everyone 500 points of experience each. 4- Above the Flow: above the waterfall and a ways upstream there is a small colony of juvenile black dragons who continually spew their acidic breath into the liquid, further tainting it. They are guided by a 5th level necromancer who hails from the Bleakgate Citadel. They will not parlay and will attack the party at their earliest convenience. Keep in mind that, once these villains are dealt with, many rewards may be made available throughout Talodrihm from its goodlier denizens! Once serving as a sparkling source of water, the lake now repels all goodly people with its taint and the threat of predatory monsters that surround it. The lake, which would normally spread and drown the whole of Talodrihm, instead slowly drains into cracks, which run into underground channels and caverns. Should the party eliminate the black dragons poisoning the water up at the Filthy Falls, the condition of this lake will rapidly improve, allowing the party to partake of special benefits! 1- North Shore: along the bend of the north shore is a stretch of tall grass and fallen, dead trees. The petrified bodies of victims who had been transformed to stone lay strewn in the grass, marking the lair of several basilisks. Their lair sports a cache of treasure consisting of many kinds of coinage, gems and a couple magical items. 2- South Shore: the rocky slopes of the southmost shoreline are alive with small, scurrying creatures as well as several deep footprints, which belong to a colossal reptilian monster. This monster comes to drink from the lake water, but is constantly repulsed by the liquid’s foul odor. Should the party resolve the black dragons above the waterfall, this creature will return, revealing itself to be the legendary Tarrasque. It will not take any interest in the party, nor will it attack unless the party attacks it, but if the party remains to watch it, they will notice it digging up part of the coast and depositing gems into a hole, which it will then burry and depart from. 3- West Shore: the tall grasses growing along the western shore hides a pack of carnivorous dinosaurs, which lie in wait to spring upon any hapless victim that draws too close. The lair of these creatures contains a skeleton, which still wears its +2 elfin chainmail. 4- East Mouth: the area where the river empties into the lake is quite rocky and active with monsters. Here stands an ancient and ruined stone building with an old stairwell lowering into a waterlogged cellar. Slithering creatures live down here, and careful searching reveals a few stone passages leading to an armory. The armory contains three random magical weapons. 5- Triple Stones: jutting from the midst of the lake is a formation of three rocky spires. Swimming or otherwise approaching these rocks will draw the attention of an aboleth, which will attack the party. 6- Undertow Caverns: a maelstrom exists somewhere in the middle of the lake and anyone who draws too near will be swept away into underground passages where they will eventually wash ashore beside an underground lake in the deep caverns that connect with the Busted Plunge. The Swill is a patch of swampland that is very easy for the party to become lost in, requiring them to take extra care in choosing how they choose to navigate it. There is also a 25% chance that, while the characters transition between parts of The Swill, that one of the aforementioned flashes of light will erupt, requiring them to make appropriately challenging saving throws in order to resist going blind for several minutes. There is also a chance that, after a flash occurs, monsters will seek to ambush them! 1- Muddy Meadow: thick tufts of tall grass grow in a mucky, muddy place. If the players are nimble, they can step and hop from one mound of grass to the next or else they may become stuck in the mud. If at any point a character should choose to step into the muck, they will need to roll a saving throw to resist becoming sick. Should the party choose to press on through this difficult terrain, they will find a great, dead tree stump. Hidden in the stump is a +2 shield and a +3 mace, but these are protected by a group of trolls. 2- Decaying Mounds: deep in the fog the party will find a colony of troll hutches. These consist of densely woven brambles coated in mud and slime with small openings. Oddly enough, the trolls who live here are quite bored with being evil, having had their fill of it under the rulership of the beings who work in Bleakgate Citadel. They now want a posher life, but realize they need fire in order to enjoy newfound luxuries, such as cooked food. If the party is able to locate an alchemist in Shacklefort, they may be able to find a recipe that will allow the trolls to create potions of fire resistance. Should the party do this, the trolls will gift them with a +4 axe and a +2 suit of plate mail. 3- Slimebark Trees: a small grove of filthy, scraggly trees emerges from the mist. In the midst of this grove, the party finds a mad mage who sits upon a stump, cackling to himself as he jabs a stick at a small cage. The small cage is occupied by a caravan of travelers who have been shrunken down to the size of mice. The diminutive victims will plead to the party for deliverance at which time the mad mage will conjure up several wild beasts and attack. Once defeated the shrunken caravan will beg the party to bring them back to Shacklefort where a mage may return them to their normal size. Doing so will bring the party a sizeable monetary reward. 4- Pond in the Muck: in a particularly lumpy part of the swamp there rests a circular pond of tepid water. The air above the water is populated by several will-o-wisps. If the party makes a careful observation they will find a straw sticking out of the water, which is being used by a trapped patrolman from Shacklefort to breathe as he hides from the deadly menaces. If the party drives away the wisps, the patrolman will thank them and gift them with a +3 lance before he departs back into the wilderness. 5- Grime Crater: a crater, born from a rock, which fell eons ago, now serves as the grassy home to a herd of catoblepases, which graze the great hole with their heads low. Should the party choose to explore this crater, they will be attacked by the dreaded monsters, but if they manage to reach the center of the crater they will find the remnants of the meteor: a solid hunk of adamantium. If the party has somehow gained the favor of the fire giants over at the Cobbled Cavern, they may be able to pay the smithy there to make them as many as five +5 adamantium weapons and/or armor. Though quite a bit smaller than the Unquenchable Lake, the Tar Fields are no less horrid. Strong numbers of monsters dwell here and the land itself sports a number of hazards, which will challenge even the most stalwart of adventurers. But the party should further take care when entering this place, for much of what they see isn’t as it seems. 1- Talloway’s Perch: standing atop a broken hill, which extends a bit into the tar, there looms a rickety tower Atop the tower, a treasure is hidden, but no sooner than the party claims this treasure, the tower will begin falling toward the tar field. The players will have very little time to escape this disaster and the topmost chamber of the tower will begin sinking into the muck, requiring the party to climb out a window and carefully walk back to shore by stepping carefully on the ruin of the tower, which now lays scattered upon the muck. 2- Gurgling Patch: along the shores of the tar there is a patch of bubbling and sputtering liquid. If disturbed in any way, a large, tentacled creature will spring forth and attack anyone standing on the shore. When defeated, the beast will sink into the tar where a few final bubbles will rise up to the surface, one of which will contain a random magical ring. 3- Wayward’s Warf: lonely little dock in the tar with a half-buried ship tied off to its furthest post. If the ship can be pulled out, it will have treasure hidden in its stern. What is more, if the boat can be cleaned out, the party may use it to ply the Tar Fields and visit locations contained further into the muck. 4- Flame Spout: one such location, which may only be reached safely with a boat, the flame spout is out in the middle of the Tar Fields. True to its name, flame will erupt from this point every so often, and if approached, an efreeti will rise up and attack. When defeated, he will drop a +2 flaming long sword. 5- Caged Curiosity: as with the Flame Spout, a boat is needed to reach these bleached ribs of a colossal beast, which jut out of the tar like a palisade of bone. At its heart is a shelf of rock with veins of gold, which may be mined for a considerable amount of money. The party should beware, however, as mining the plentiful gold will draw several tentacled creatures similar to that, which attacks from the Gurgling Patch. 6- Shack in the Muck: the final location in the Tar Fields, which may only be reached with a boat, the Shack in the Muck consists of an old manor house, which has sunken halfway into the slime. Strength will be needed to pry open the main doors, but once open the party may paddle their boat into the mansion. Many rooms lay open to the goo and careful searching will deliver up treasures to the party. Creatures lurk in here, however, and will attempt to slow the party’s progress through the ruin. Pillar Maze not only sports a sort of maze of trails, which wind around the great columns of rock, it also has trails that lead to higher climbs. The players have a slight chance of becoming lost as they travel from one area to the next, and the entirety of the Pillar Maze is threatened by many kinds of poisonous creatures. 1- Intertwining Trails: confusing network of passages and trails in the Pillar Maze, which contain an ambush point from whence venomous serpents spring and attack the party. Any time the party wishes to travel to a new area they must pass through this maze. 2- Wondrous Mosaic: painted on a great slab of rock is a mosaic, which contains words written in an obscure language. Anyone able to read the inscription will trigger a spell, which breaks the mosaic in half and open a secret passage into a cave. The cave contains a shimmering pool of water. Anyone brave enough to look into the pool will have to resist the effects of a powerful spell or else be flung against the wall, suffering damage equal to half of their health. A success will reveal the tiniest portion of the vast knowledge of the universe, granting that person enough experience to level up. This may be done only once per person and failure means they miss out entirely. 3- Rock Heap: a dead end in the trails created by a landslide of broken stone. If disturbed it will rise up and become a formidable earth elemental. If defeated, the dead end will be gone and the party will find the smashed remnants of an old trade caravan containing much treasure. 4- Twisted Creek: a small creek meandering through the columns comes to an end at the skeleton of a dragon. Careful inspection will allow the party to listen to the water as it tumbles down a hole directly below the deceased dragon’s skull. A chain connects to the neck of the dragon and lingers down into the hole. When drawn out it will deliver a +3 halberd. 5- Meddler’s Secret Cave: following strange clues will lead the party to a crazy old man’s house, which he keeps sealed off with a tiny entrance, but anyone who passes coins through the aperture will be able to buy magical items of up to +3 in quality. 6- Ice Gaze: a narrow passage between the immense columns becomes chilly and eventually leads to an area where everything is coated in ice. At a dead end there is a mirror from whence blows frigid air. If stricken with a blunt magical weapon, the mirror will shatter, ending the cold and bringing an ice devil into the area. When defeated, the ice devil will drop suitable treasure. 1: if the party is aggressive towards the dragon, it will attack them, meriting nothing more than experience from combat. 2: if the party is respectful, the dragon will grow bored with them and fly away, providing neither experience nor treasure. 3: should the party address the dragon in any way that seems silly or humorous, the dragon will take a liking to them and gift them with two random magical wands. The Charnel Hollow, which once served the fiends of Bleakgate Citadel, has long been abandoned and left to serve as a habitation to many dangerous creatures. Though no longer inhabited by intelligent beings, many of their treasures remain for those brave enough to enter. This location is very important as it contains the Key of Scourges, which is one of many things needed to enter into Bleakgate Citadel. 1- Bloodlogged Entry: cave-like entrance whose ground is drenched in blood and mud, and slithering with dangerous creatures. Apart from imminent monster attacks, the party will also need to roll appropriate saving throws to resist becoming diseased. Carefully searching through the bloody entrance will turn up the skeletal remains of a warrior fully kitted out with a +2 mace, a +2 suit of chainmail, and a +2 shield. Searching will further expose those who participate in it, however, possibly requiring greater care. 2- Rib Galleries: the many tunnels and corridors that join the rooms of Charnel Hollow together are lined with tall, curved ribs, and the keystones of their arched ceilings are made from many spinal columns. Some of the ribs have gaps between them, which are sufficiently wide enough to allow monsters a place to hide and ambush trespassers from. The party must travel through the Rib Galleries any time they transition between rooms. 3- Eyes of the Feast: a large chamber in the Charnel Hollow is decorated with the skull of a colossal creature. The eyes of the skull cast a glow upon the room through the use of enchanted, glowing rocks set into the sockets. Anyone entering into this room must roll an appropriate saving throw to resist going mad and attacking their teammates. Removing the victim of this trap from the room will end the curse, but any time one enters the room they are subject to the effects again. Anyone who manages to resist the glow may search the room. Diligent examinations will reveal a cache of 10 gems hidden in a small box within the mouth of the skull. 4- Central Cavity: great, open room, which rises up through the middle of the Charnel Hollow. Many limb bones serve as support columns and the many balconies of rock and bone, which line the chamber spiral up to an open roof. Flying dinosaurs have established nests upon these balconies and will attack anything that intrudes upon their domain. Clearing some of the nests will allow the party to find several small caches of coins, provided they can free the coins from the many snapping beaks that protect them. 5- Steadfast Studies: the upper floors of the Charnel Hollow contain many small rooms, which once served as housing for the former denizens of the place. Here the party will find a number of spell scrolls dealing with necromancy and other foul forms of magic. Many creatures wander these rooms, and careful searching will bring the party to a particularly large study where a random magical staff is contained. Scurryclambor is a inordinate orc and goblin commune, run by their boss, King Stoger. It is important to note that, should the party reach King Stoger, this location will begin to terminate, meaning the party will not be able to return afterwards. It also means that the terrain will become very hazardous as it will commence burning. This should by no means prove impossible for the players to escape, nor should it be excessively difficult, but lingering too long in a single area while it begins to burn should prove harmful. 1- Shooter Alleys: any of two narrow canyons that wind into Scurryclambor, which are protected by many platforms from which archers shoot at intruders. These routs into Scurryclambor should prove risky, requiring thoughtful tactics as the archers and marksmen have ample cover from their shooting positions. What is more, they are armed with flasks of burning oil, which they will use on melee combatants who draw too close. The players should encounter around five or so of these platforms, and each platform will have a cache of arrows and crossbow quarrels as well as small monetary prizes. 2- Puke Shacks: collection of huddled goblin homes along the bottom of the canyon’s central hub. These basket-like structures cling to the lower walls of the canyon and are filled with tools for crafting weapons and armor. They also have many deposits of simple weapons and armor, such as clubs, maces, leather and hide armor, and short swords. Many goblins police and secure the Puke Shacks and will attack any intruders on sight. 3- Jihm’s Jungle: expansive network of ramps, scaffolding, ladders and bridges, which span the open spaces between cliffs. These rickety walkways are used by the party any time they wish to transition from one area to the next, and these are almost always patrolled by no fewer than ten orcs and two or more bugbears. Because of the haphazard nature of the bridges and walkways, there is always a chance that the party will become lost while in transit. 4- Bulley Bungalows: housing for orcs and some bugbears who lounge about, drinking and gaming. Though numerous and well-equipped, these brutes won’t attack intruders immediately as they are engrossed in their revelry. The moment a player encounters one, however, the whole place will come down on the party, numbering in total around fifty orcs and ten bugbears. Clearing out this area will grant the party access to a cache of gold as well as three random magical weapons. 5- Uggle Shrine: crude, wooden temple where a statue of an orc with many arms is worshipped. An orcish priestess runs the shrine and is accompanied by a dozen orcs who prostrate themselves before the statue. The moment the orc priestess detects intruders she will hurl potions at the assemblage of her kin, which will allow them to fly into a rage, which grants a bonus to hit as well as to damage. The shrine has a cache of treasure, including two random magical items. 6- Storehouse Keep: tall tower whose outer walls jut from the face of the cliff and are decorated with the spine and ribs of a great monster. Guarded by a well-armed and armored group of bugbears, this storehouse secures Scurryclambor’s most prized resource: their ale distillery. Should the players choose to enter this place they will have to face off against a force of twenty bugbears, each armed in full plate mail and wielding two-handed melee weapons. The plans for their prized ale are kept at the very top in a locked strongbox. A brewmaster back in Shacklefort will pay some 10,000 gold coins for this recipe if it is brought back. 7- Greatness Climb: switchback of ramps and catwalks leading up to King Stoger’s Hut. Similar to the Shooter Alleys, this route is perilous as King Stoger has some of his best-equipped orcs and bugbears positioned on platforms, which loom over each turn. Totaling six, these towers provide ample cover for their defenders. 8- King Stoger’s Hut: at the very top of Scurryclambor is the home of the much feared King Stoger. By the time the party reaches this area, King Stoger will be fully appraised of their coming and will be lying in wait with his company of orcs and bugbears. King Stoger is a higher-level fighter with the ability to spew forth flames as he takes a swig from a bottle of potent ale and exhale it through a grasped torch. Once defeated, King Stoger will erupt into a gout of flame that will trigger the aforementioned destruction of Scurryclambor. Once this event transpires, the party will need to find a swift rout for escape as the entire location will begin burning quite rapidly. Once they escape, the party may wish to wait until the fires subside at which point they may search for extra treasure. Doing so will turn up a sizeable amount of various coins, some gems and another two random magical items. The party will also find a box containing a banner, which was stolen from Shacklefort. If this banner is returned to Shacklefort, the cost of all purchases will be reduced by 10%. Likewise, anything the party sells at Shacklefort will bring in an extra 10% in sales. As stated in the description, the initial passages between the boulders are quite narrow, requiring even shorter party members to crouch or crawl. This should noticeably restrict the party’s ability to maneuver, at least until they reach the nucleus of the location, which has boulders so massive that the spaces between them admit much larger creatures. 1- Outer Range: tight ring of smaller boulders, which one must crawl between to get anywhere. The monsters in this area should be smaller or at the very least lower to the ground, making it easier for them to lie in wait. Diligent searching will bring the party to discover the corpse of another adventurer whose remains contain a small amount of treasure and a +2 dagger. 2- Middle Range: though not quite as confining as the Outer Range, the Middle Range is a veritable maze, which one may easily become lost in. Larger monsters stalk this area and congregate around pools of water. Should the party encounter one such pool, they will find a sizeable encounter of enemies to fight. Searching the pool may trigger more enemies into an attack as aquatic creatures spring forth. Further searching the pool will lead to the discovery of a wooden chest. This chest is stuck in the muddy floor of the pool, requiring a hefty strength check. Success will create an annoyance as pulling the box free will cause its bottom to break away and its contents, several varieties of coins, to spill out along the bottom of the pool. Should the party seek out more pools, they will have similar encounters, though without the prospect of treasure. 3- Dense Cluster: the nucleus of Bouldershade provides much more headroom to would-be explorers, but there are far more monsters gathered in this portion. Water is also quite plentiful, running in long, waste-deep puddles between the rocks. As the party travels they will hear someone playing the lute. Following the sound of the music will lead the party to a small clearing between three exceptionally tall boulders. The music is being played by a strange woman wearing a mask. If approached she will stop playing and invite the party to come over and join her where she is sitting upon a rock in the middle of a wide pond. Any attempt to approach her will be met by her casting off her mask and taking on the form of a hag. What is more, she will cause several ghasts and ghouls to rise up out of the water and attack the party with her. 4- Secret Tunnel: should the party deal with or ignore the hag in the Dense Cluster, their continued searching through the area will bring them to a small, muddy tunnel, which runs beneath the largest, centermost boulder in Bouldershade. The tunnel comes to a dead end where root-like growths cover the walls. Pulling on these roots will cause a wall of earth to break away, revealing a new tunnel, which spiral downward, deep underground. 5- Underground Lake: following the Secret Tunnel down will bring the party to a wide, underground lake. The earthen ceiling above is low and drips with water, which accumulates into the lake. In the center of the lake is a spire of stone, which connects from the floor of the lake to the ceiling, directly below the largest, centermost boulder in Bouldershade. A skirt of earth surrounds the stone spire and many skeletons lay strewn about its banks. If disturbed, they will rise up and join together, forming a skeletal giant, which will begin to smite its arms against the stone spire. This will cause the cave to shake and parts of the ceiling to come crumbling down into the lake. By the time the party reaches the Secret Tunnel, the central boulder will fall through the cave ceiling. When the party climbs out of the tunnel, they will find a new passage leading up to the surface where they will discover an immense hole in the middle of Bouldershade, marking the former location of the largest boulder. Before they can leave the area, however, the giant skeleton that triggered the catastrophe will climb out of the hole and attack them. When defeated, its body will contain all of the parts of a complete suit of +2 full plate mail armor. The Crimson Hive is the lair to a vast, maze-like ant hive. Though similar to other monstrous giant ants, these ants have fallen under the influences of a spell, which has permanently altered their very nature, allowing them to breath fire as a dragon. Many other things dwell here, but the ants themselves reign as the most predominant presence in the intertwining tunnels. This location is very important as it is the hiding place of the Red Pearl, though the party should discover it naturally when they reach the Queen’s Nest. 1- Entrance: many entrances dot the exterior of the Crimson Hive’s outer mound, and each of these are guarded by several soldier ants. The base of the mound is littered with the bones of dead creatures that had unsuccessfully attempted to raid the hill, but were repelled by the colony’s guards. Any attempt made to enter the hive will be met with heavy and fierce resistance on the part of the ants. Should the party leave the hive and return they will be met with the same amount of resistance. 2- Upper Networks: tunnels where worker ants expand their networks for the purpose of creating more hive structures. One particular tunnel seems to be running directly for Shacklefort and should it go ignored, the town will face an ant invasion within the week. Should the party wish to halt digging in this tunnel they will have to face against an antion, which labors at the head of the tunnel. Once this creature is defeated, its death throws will trigger a cave-in, closing it off for good, though the party will need to scurry out before they become trapped. 3- Middle Networks: the most expansive tunnel networks in the hive, which are so sprawling and uniform that it is quite easy for the party to become lost. Soldier ants regularly patrol this network and will typically ignore anything they find down here unless it directly impedes them or becomes hostile in any way. Once the party triggers an encounter with soldier ants their scent will be broadcast to the entire colony, drawing regular attacks each time the party transitions between areas. 4- Deep Storage: only accessible through the Middle Networks, the Deep Storage serves as the colony’s pantry. Should the party choose to explore these tunnels they will find an abundance of preserved organic matter, both animal and vegetable. Extensive searching will lead the party to a trapped group of Dervishes who are glued to the walls by the ants’ adhesive secretions. If freed they will speak of a hoard of treasure in the Queens’ Nest, and one Dervish will claim to have seen an enormous red pearl among the loot. 5- Egg Chamber: only accessible through the Middle Networks, the Egg Chamber contains the next generation of ants: tens of thousands of eggs cover the floors, walls and ceilings of these tunnels. If the party enters here they will hear the laughter of a madman who bears a torch. If addressed or approached, the madman will threaten to set fire to the hatchery, which he says will draw the entire hive after him. While this is only partially true, it would indeed cause at least a dozen soldier and worker ants to respond with a violent onslaught. 6- Queens’ Nest: only accessible through the Egg Chamber, the Queens’ Nest is a single large chamber at the very bottom of the colony where the walls are covered in mold and decay. The queens roam around here, each surrounded by an entourage of soldier ants. These will attack anyone who comes within thirty feet as they guard, not only the queens, but a pile of treasure, which stands in the middle of the chamber. Standing atop a pile of gold and jewels is the Red Pearl, which is needed to disable the barrier around Bleakgate Citadel. The woods contain many monsters as well as illusions, which will be mentioned with each area. This area is important as it contains the Writ of Opposition, which lists the other items needed to break through the barrier around Bleakgate Citadel. 1- Wooded Maze: entry into the woods immediately becomes a winding labyrinth of densely packed trees and thickets. These features have all fallen under an illusionary curse, giving the appearance of promising locations, but quickly melting away and revealing still more woods. Any time the party travels from one area to the next, they run a serious risk of becoming lost. 2- Clustered Clearings: five small clearings, each containing an illusion and subsequent challenges that the party must overcome. The clearings are encountered as the party explores the woods and may be introduced as frequently as the referee wishes, though one should never be able to revisit the clearings. If the party chooses not to enter a clearing, they should be allowed this decision. A: this clearing becomes bright and sunny as the party enters. Off to the side they see a pleasant cottage, which permeates with a smell of freshly cooked bread. Inside the cottage is a table set with bread and soup, and a note, which explains that the persons who created this place wish to aid the party on their quest. Should the party take advantage of the hospitality, they will need to roll an appropriate resistance against the illusion. The cottage is actually in ruins and the clearing dark and malevolent. The cottage is filled with webs spun by the giant spiders, which lay in wait to prey upon hapless victims. B: the second clearing contains a flowery meadow with a tree stump rising from its middle. Should the party wander out into the meadow, they will suddenly find themselves falling and sinking into a muddy bog. The stump actually exists and if anyone manages to swim over to it, they will find it infested with large centipedes, which guard a sack of gems. C: the third clearing is quite empty apart from the cluttered twigs and rocks, which lay scattered across the ground. If disturbed, these will rise up and shed their disguises, revealing a hoard of zombies. D: a fourth clearing opens into a cave. The cave leads into a winding labyrinth that the party immediately becomes lost in, should they fail a needed saving throw. The party will remain lost in this labyrinth unless they succeed on their saving throws, which may be made every ten minutes. Successfully saving will dispel the illusion, revealing it to be the outside of the woods near the lair of a hydra. E: the last illusion contains a small pygmy village where a man is being kept in a cage and threatened with death. The man will beg the party to rescue him, upon which time the pygmies will attack. Goblin or xvart stats may be used for the pygmies, and once they are defeated, their captive will thank the party. At this moment, the illusion will fade and the party will find ruins and skeletal remains of the pygmy village, along with the broken cage, which once held the prisoner the party had rescued. 3- Twin Hag’s Hutch: a pair of witches dwell in a house built under the roots of a giant, muggy tree. The witches will attempt to lure the party in with promises of discounted magical items. Once inside, the witches will dump over a large cauldron whose contents will splatter across the floor and harden into a powerful adhesive, requiring a saving throw to evade the goo and possibly a strength roll to break free once trapped. After the adhesive settles, the hags will attack the party with spells and conjured bats. 4- Grand Canopy: in the middle of the forest is a trio of exceedingly tall trees whose tops rise far above the woods. Suspended between the three trees is a small, ruined hut. Inside the hut the floor is broken away, leaving a sheer drop. Against the back wall of the hut, a random magical sword is mounted to the wall, but cannot be reached except by carefully skirting the walls where parts of the original floor remain. From this translation, Hennik will explain that it speaks of the Wand of Recharge and a Red Pearl, which he believes to exist somewhere in the wilderness of Talodrihm, though the party’s guess is as good as his where these objects exist. The Busted Plunge is a crevice that drops down into a vast network of cave systems controlled by the Drow. Most of the terrain in this place is wild and rocky, but the party will come across hand-carved caverns and stairs, which will foretell the presence of intelligent and dangerous beings lurking further down. This location is important as it contains the Wand of Recharge, needed to replenish the energies of the Red Pearl. 1- Ledge of Descent: the only means of safely walking down into the Busted Plunge is along a narrow ledge, which descends steeply into the blackness. People who had previously braved the descent were charitable enough to affix a rope and steel steaks into the rock wall, allowing one to hold fast as they carefully slide down the trail. As the party makes this trek, the wind will continually buffet them and as they descend halfway, a swarm of bats will attack, requiring them to fight carefully. After facing this obstacle, the party will find the ledge leveling off until it gracefully brings them into the Upper Tunnels. 2- Upper Tunnels: easily the most confusing network of tunnels in this part of Busted Plunge, the Upper Tunnels are a veritable maze of raw, earth and stone caves and conduits. Monsters make this their home and make use of the darkness to pounce upon any hapless victims who wander through. Should the party manage to avoid getting lost, they will reach the Farflung Grotto. 3- Farflung Grotto: a downward-sloping cavern running some fifty feet wide and nearly a thousand feet long whose floor is strewn with boulders. Some creatures scurry about in here, but once the party approaches the middle of this long cavern, grimlocks will dislodge a boulder at the top, causing a cascade of bolders to come rolling after the party. This threat will require appropriate saving throws and careful movement as the great rocks tumble through. The rocks will collide with the end of the cavern, breaking open a wall, which will lead into the Middle Caverns. 5- Mushroom Forest: this wide, open cave is populated by many tall mushrooms. The stems of these mushrooms are as hard as oaken trunks and serve as home to ferocious grimlocks. These savage humanoids dwell in small hunting caps spread throughout the Mushroom forest. The camps are used mainly for sleep and to store dried meat, but carefully searching them may produce a stash of gems. Should the party become lost in the Mushroom Forest, they will be ambushed by a large force of Grimlocks. In the middle of the Mushroom forest is a great salt pit, which contains a hidden passage down to the Lower Corridors. 6- Lower Corridors: the final network of caves in the Busted Plunge connects with a great, watery lake. This lake connects with the Undertow Caverns in the Unquenchable Lake. As the party explores the Lower Corridors they will find it becoming more refined from the workmanship of unknown hands. Inspection of the gradually developing architecture will reveal this to be the domain of Drow elves. At the end of the Lower Corridors, the stonework is fully refined and converges with a large set of doors guarded by a small force of Minotaurs and Drow elves. Defeating this force will grant the party access to the Drow Enclave. 7- Drow Enclave: this fortified network of Drow tunnels is made from hardened stone and protected with many traps, both physical and magical. The Drow are organized and use sound tactics to ambush and attack the party. What is more, as the party presses forward through this place, the Drow will eventually release a Beholder or some similar creature. Defeating this creature will send the Drow retreating from their own domain, never to return. What is more, the force of Drow who released the Beholder will also drop the key to the Flooded Vault, which may be found at the bottom of the Drow Enclave. 8- Flooded Vault: lowest reaches of the Drow Enclave where the halls have become flooded and infested with creatures. The party will need to swim through this area and search its scattered rooms for the Wand of Recharge. Once they recover this object, an evil dragon turtle will awaken and pursue the party. When defeated, the party will find the dragon’s hoard contained in the front of its shell. Originally the fire giants became trapped in Talodrihm after creating a successful iron mine. This very mine now serves as their refuge until they may finally leave and return to their kin far to the north. As stated above, these fire giants are not hostile and will even trade with the party, provided they are peaceable in their dealings. If at any time the party proves hostile, the giants will seal off their gates to them forever and place over their domain a barrier of strong magic. 1- Grand Entryway: these grand gates are guarded by several stout fire giants and a powerful ballista positioned just in the entrance. Approaching the giants amicably will allow the party to enter their domain, though any violent or threatening attitudes will cause the giants to retreat into the Grand Entryway and fire off their ballista. Should the party be caught in front of the ballista, they will need to roll an appropriate saving throw to prevent dying instantly as the bolt fired from the ballista will explode violently, sending steel shards in a 100x100 foot area. 2- Communal Tunnels: housing of the giants where the players may take on quests from three individuals. Fulfilling these quests will earn the party a decent amount of experience points and gold. A: large barmaid in the PUB continually combs her long, literally smoldering hair, but grows distraught each time her comb catches fire, requiring her to procure another. If the party can bring her a large, steel comb, she will be most grateful. The smiths in Shacklefort may be commissioned to build such a comb at the cost of 1,000 gold coins. B: tired old giant who sits on a stone bench in one of the hallways of the Communal Tunnels grumbles to himself as he rummages through his scrip. If asked what the matter is, he will explain that he has misplaced one of his favorite books. He explains that he last had it by the Grand Entryway. Searching around the Grand Entryway will turn up a tiny, worn book. If opened, the book will grow to a size appropriate for a giant to handle, possibly harming any party member who attempts to read it. C: young fire giant girl who is kneeling down beside a hole in the wall. Though a mouse hole to the girl, the opening is just wide enough to admit a normal person. The girl will explain that her dear pet has vanished into the hole and she would like it back. Should the party enter into the hole to find the pet, they will become confronted with a powerful warg. It turns out the warg is the girl’s pet and if it is killed, she will not reward the party and they will only gain experience points for slaying the warg. 3- Solar Forge: a great forge powered by a crystal set in the ceiling. The crystal draws light from the sun’s rays and condenses it into a beam used to continually heat metal as they shape it. Unfortunately, with the overcast skies and darkness prevailing in the land, the crystal doesn’t function at its fullest. If the party can destroy the barrier around the Bleakgate Citadel, it will restore enough of the crystal’s power, allowing the giants to create up to +4 weapons and armor, which the party may purchase from them. 4- Chieftain’s Chamber: location of the fire giants’ chieftain who will provide quests for the party in exchange for magical items and coins. A: travel to Shackelfort and retrieve a wagonload of supplies, which must be protected by fending off raids made by psychotic bandits. The reward for this quest will include several gold coins and one random magical item. B: enter the forbidden cellar and trigger a mechanism that will collapse the lower tunnels, sealing off the pesky drow. The reward for this will be another payment of gold and two magical items. See area 5 for more details. 5- Forbidden Cellar: just below the Communal Tunnels is a sprawling cellar, which was once used to store food and supplies for the fire giants. Now it is taken over by drow soldiers and giant lizards. After clearing out the cellar, the party will find a tunnel, which the drow had dug into the fire giant’s stores. Here the party must place a metallic orb, which the chieftain gives them. The orb has a pin set into it and once the pin is struck, the party must flee the cellar before it goes off, sealing away the tunnel and the drow. The Ring of grandeur is a massive coliseum with many levels, still active with animated constructs and golems, as well as the gorgons: bulls and medusas who prey on living intruders for sport and for food. Many treasures, such as magical weapons and armor, remain hidden throughout the Ring of Grandeur, waiting for skilled adventurers to claim them. 1- Archway of Victors: grand archway leading into the coliseum. Just beyond the ornate pillars is a gallery filled with statues dedicated to previous champions of the arena. Some of these statues are broken and many still will come to life and attack the party. Carefully searching this area will reveal a bronze plaque mounted on one of the walls. The plaque’s inscription was scratched off and any attempt to handle the bronze plating will cause it to fall, requiring a saving throw to avoid harm. What is more, an empty cavity in the wall was covered by the plaque and with it removed, a swarm of venomous serpents will come streaming out. The end of the gallery divides into the East and West Galleries, which encircle the entire coliseum. 2- East Gallery: this gallery is lined with heavy columns behind which several medusas hide, waiting to petrify and fire arrows upon the party. This gallery has many doors, which lead down to the cellars and up to the Audience Seating. Carefully searching this gallery will reveal a great banner, which has the image of a princely-looking fellow holding a scepter. A knowledgeable character, or one able to cast a Read Language spell will translate the writing along the hem of the tapestry. Reading this will cause the rendering on the tapestry to come to life and attack the party as a 5th level spellcaster. Upon being defeated, this enemy will drop a random magical rod. 3- West Gallery: this gallery is similar to the East Gallery with the exception that it has a fountain set at its midpoint. The fountain has many old and tarnished copper coins stuck along the bottom of its reservoir, which is overflowing with filthy water. Tossing coins into the fountain will restore some of its original luster, depending on the amount. 100 gold pieces worth of coins will restore it a little and cause one of the sputtering fish spouts to drop a random gem. 1,000 gold pieces worth of coins will cause the spout to drop a random art object. 10,000 gold pieces worth of coins will cause the fountain to drop a random magical item and fully restore the fountain, causing it to usher forth a supply of fresh water. The fountain will only drop one of these items. This gallery has many doors, which lead down to the cellars and up to the Audience Seating. 4- Arena Cellars: the cellars of the coliseum contain many empty prison cells, which radiate around a central lift, which leads up to the arena floors. Many monsters dwell in the Arena Cellars, the most fearsome of all being an 8-headed hydra, which stalks about and has a 25% chance of appearing every 10 minutes. The hydra normally had a 9th head, but this head is pierced with a +3 trident, which may be claimed once the hydra is slain. 5- Arena Floors: only reachable from the cellars, this place has an ambush lying in wait for the party. Arrayed all around the lift, which comes up through the very middle of the Arena Floors, is a force of clay golems and one iron golem. The lift will be locked in place, requiring the party to either fight, die, or hide among the columns that ring the sandy battlegrounds. An old chain hangs from the Audience Seating. Should the party defeat the golems, a ghostly king will appear up at the King’s Balcony and throw down a +4 short sword made from bronze wood. A small inscription on the hilt of the short sword declares the possessor of the weapon a free man. While this sword is sheathed at the user’s side, he or she will become immune to normal bonds and spider webs. 6- Audience Seating: circular, raked seating surrounds the arena with its lowest seats some fifteen feet above the sands. Scavenging creatures, such as rats and vultures still pick at the bones of other monsters who perished up in the stands and the scattered coins of spectators from ages past still lay on the dusty stone floors. Carefully searching the seating will bring an assortment of coins totaling around 300 gold pieces. At the head of the audience seating is the King’s Balcony, which may be reached by flanking stairs that join with the Audience Seating. 7- King’s Balcony: only reachable from the Audience Seating, the King’s Balcony has a ruined awning, which sags over an ornate throne. The ghost of a past king will appear here if the party successfully fights in the Arena Floors, but no such aspiration exists when the party enters the King’s Balcony. Instead they will find a curious, cloaked figure leaning against the rail, looking down over the stadium. If approached, the figure will turn around, revealing itself to be an iron golem armed with a great sword. The golem will attack the party, along with four stone golems, which will rise up out of the balcony’s enchanted stonework. Defeating this encounter will allow the party to claim the iron golem’s great sword, which will turn out to be a +2 weapon. “What at first seems like a mirage turns out to be the fossilized remains of an ancient tree. Once nurtured by caring elves, this cracked and ragged monolith now stands only as a reminder that anything green once thrived in Talodrihm. The Wormhollow Monolith is an essential location to the peoples of Talodrihm as it once used its magical properties to purify all water in the desert. Now it is little more than a dry, barren husk jutting out of a bleak, sandy wilderness. The party has a chance to revive the tree and doing so will bring them a sizeable reward, both in terms of gold and experience. 1- Hole at the Base: a tall yet narrow opening leads into the rocky trunk. The walls splinter off into petrified shards, which may be used to produce strong arrowheads. If the party chooses to harvest these, they will be attacked by a host of centipedes, which nest throughout the splinters and cracks of the stony wood. 2- Passage Up the Trunk: a spiraling stairway made from petrified wood, which runs straight up and down the tree’s interior. Many monsters live in here, using the shade of the tree as protection from the heat. Anyone traveling through the trunk will be subjected to an attack by spiders and centipedes, as well as drider, who nest deep in the Cavern at the Roots. 3- Cavern at the Roots: down in the bottom of the tree is a winding cave system choked with hardened roots that even the strongest axe cannot cleave. Driders use this place as their home and lurk up on the ceiling, out of sight until they can find a good opportunity to ambush the party with their bows and poisoned arrows. The lowest cavern in this winding network of caves holds the driders’ treasure hoard, which they guard carefully. 4- Branch Labyrinth: network of tunnels, which run through the many branches at the tree’s middle. These are infested with ettercaps and scorpions, which will come surging after the party in great numbers to prevent them from reaching the Sundered Canopy and the Outer Limb. This encounter should be very difficult, but not impossible! 5- Sundered Canopy: passage up the trunk ends at the very top of the tree, which was broken off ages ago. Now it opens and becomes the web-draped lair of a massive spider who guards a mighty axe. This weapon is a +4 axe, which will require a feat of strength to remove it from the rock-like flesh of the tree. 6- Outer Limb: a tunnel opens through the trunk and leads out to a long, narrow branch, which against all hope has clung to a tiny fraction of its life. A small, struggling sucker grows out of this branch, near the very end, requiring a great deal of finesse to reach as the winds blow and cause the branch to sway. The sucker may be used to bring back life to the entire tree, restoring it to its former glory. Should the tree be restored, the few elves in Shacklefort will invoke a blessing from their gods on behalf of the party, causing them to gain a very large sum of experience points, sufficient to bring them to their next level. “Just ahead an entrance stands to a tunnel from which comes an acrid stench so foul that your knees buckle. Following it clear to the end brings you to a small canyon surrounded by high, rocky walls. Piled throughout this place is all the refuse and filth from over a century of accumulation, festering with disease and monsters of the worst sort. 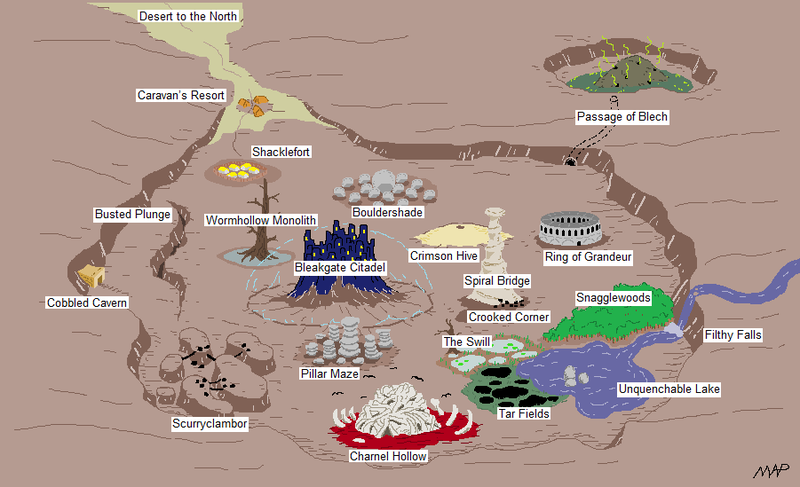 A tunnel to the north east leads to a hidden canyon full of garbage where creatures and villains have deposited their filth for quite a long time. This place is quite optional, and should the party choose to enter here, they will run a high risk of contracting illnesses and diseases, some of which may prove fatal of left unchecked! With the risk, however, comes the promise of great reward as this location possesses some of the best treasure in the campaign! 1- Foul Entrance: the ghost of a muckraker sits near the end of the tunnel. The specter explains how many places in the continuum use this very spot to abandon their waste. He then warns the party to tread lightly as, apart from waste, strange creatures have also appeared in this place, some possibly having mutated out of the magic and garbage in the area. 2- Putrid Pools: surrounding the Disgusting Mound is a string of filthy and heavily polluted pools of liquid. If the party hopes to reach anything in this location, they must either wade through the water or fly over it. Stepping through the muck will subject the party to terrible diseases, and possibly attacks from several monsters. 3- Wretched Hive: tunnels run under the Disgusting Mound, connecting several small chambers together. Monsters dwell in these chambers and hoard treasure. As with the Putrid Pools, the party runs the risk of contracting diseases simply walking through these tunnels, but carefully searching each chamber will turn up two unique magical weapons and two unique magical suits of armor. 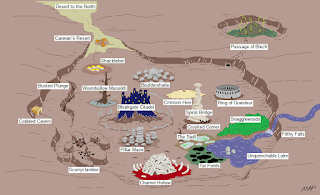 4- Disgusting Mound: the Disgusting Mound rises high into the air and its revolting surface is speckled with large holes, which connect to the Wretched Hive. Several monsters scurry about the surface of the mound, but at its very top is a shack made from moldy, crumbling wood. An old goblin lives in this hut and claims to have a potion that will imbue its imbiber with a constitution to equal his own. He will charge some 50,000 gold pieces for the potion and, true to his word, the potion will permanently increase the drinker’s constitution by 2 points. This is a quick rundown of important McGuffins needed by the party in order to complete the campaign. If ever you become lost, check to make sure the party has these items, which are listed in their respective locations throughout Talodrihm! The Key of Scourges, which is found in Charnel Hollow needed to enter Bleakgate Citadel. This marks the end of the campaign. Thank you for playing Talodrihm, I look forward to providing more adventure modules for the Dungeons and Dragons/Pathfinder role-playing systems. As you roll with your dice, may the dice roll well!